1935 Royal DeLuxe portable. Grandma’s. Looks alright, eh? The problem: Everything I’ve used as a desk since 2009 was makeshift, small or not deep enough to spread out any work. 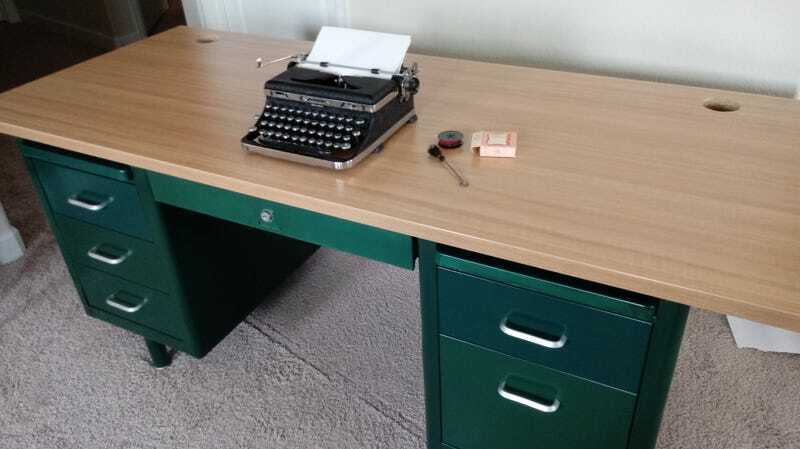 So I finally did something and got a mid-century styled metal tanker desk from Craigslist; also found a six-foot heavy wood top. The two were made for each other so I just had to get them together. I got in my Tacoma and headed out. I picked up the desk from pretty much the definition of a farm-house. $100 with only dents from the old-style metal office chairs against the inner pedestals. The drawers were straight which meant that no matter what other minor dents it had, it was fixable easily. I began on it by unscrewing and unbolting everything. The top was a white laminate metal top designed for the worker to crawl underneath and survive a building collapsing earthquake. The whole desk weighed about a hundred pounds. Imagine old battleship grey and off-white work surfaces under fluorescent light in a grey cubicle. Nope. I then got a wooden top. $45 Craigslist find. The guy had a small warehouse with things from all sorts of clearouts. If you think 1-800-got junk is kind of a ripoff by what they charge by the cubic foot of truck space to haul away your crap, then its doubly so as the store owner can keep the junk and get rid of it by selling it on Craigslist. So he had done a huge office clearout with some very high end, although well used, HON products. That’s what I got. A 1-3/8" thick, 30 x 72 surface with lots of screw holes underneath from various uses. Very stout. So I got to work on the metal bits. I didn’t think much about it other than lightly scuffing the paint as directed by the paint cans and internets describing painting already painted metal. Then I started my first adventure with Bondo filler. One teeny spot wouldn’t fill. Tried twice, so I just left it and hoped it wouldn’t look too horrible. After this and all the sanding of Bondo and the desk, I realized that old metal shouldn’t be sanded. Something about Lead and breathing it in and the dust all over the place, I dunno. Sounds like fake science keeping my personal manufacturing down. I’ll have to watch myself and see if I have memory-loss or sluggish muscles. I attacked it with a 2 in 1 primer that fills light scratches for smooth finishes. So they say. In the end, yeah it about does it’s job. If you hand sand metal, you will leave scratches and this stuff does indeed fill those in. Then I started in on the “Hunter green - satin” rattle cans. Recipe: 120 grit sandpaper squares and a RIGID power hand sander, 8.5 cans of Hunter Green, 3 cans primer, 2 satin clear coat. Probably $100 in paint. $250 all-in and I gots a big beefy desk and lots of workspace. The new desks of this size are roughly $400 and on up. Not all are this heavy and solid. The computer case is by the wall under the side overhang. I got the red lamp in High School 25 years ago. By it are bookends where some references will go. Above each pedestal are slide outs for open books or even more surface area to work on. I don’t think I’ll need anything else for a very very long time. Each drawer is at least 25" deep so I can stash decades of junk in there. This also means I have no excuses for putting off the writing projects. Now to distract all that with a mini restoration.